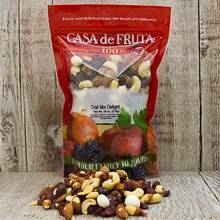 A healthy and delicious blend of raw cashews, cranberries, roasted almonds, butter toffee almonds, dark chocolate raisins, and yogurt raisins. Great as a snack or sprinkle on yogurt and ice cream! The perfect blend of sweet and salty. Packaged in an 18 oz. bag.